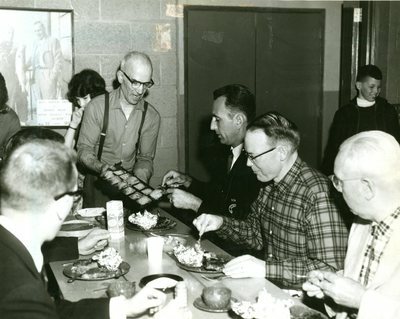 A black and white photograph of Maine guide Charley Miller serving one of his famous meals at the Augusta Sportmen Show in 1964. A handwritten caption indicates that Maine Governor Reed and Bob Cousy are among the men seated at the table. Stamped on the back, "Credit Line / The James Clark Studio / Mar 25 1964."